Think beautifully soft knits in a variety of necklines and thicknesses, classic and eye-catching sheepskin jackets, a modern twist on the classic kilt and our stylish and practical waterproof coat collection. Everything you’ll need to look on trend and stay warm and dry over the coming months. We are proud to be regarded as one of Great Britain's no.1 sheepskin experts, not only do we still handcraft our footwear and accessories here in Cornwall, we also offer stunning sheepskin outerwear designed to last throughout the seasons at an affordable price point. This season we are crazy for colour blocking and that has extended into our outerwear and knitwear range. You’ll spot this trend in our Sheepskin Colourblock Coat, which features a range of specially selected sheepskin in a pastel stripe pattern. Here we’ve contrasted smooth Toscana with flamboyant Tegrados to create the most fashion-forward outerwear piece in the collection. To complement this, we've introduced our Long Colourblock Gilet, crafted from 100% Toscana in tonal shades. Style with a roll neck for the ultimate chic style from autumn to spring. 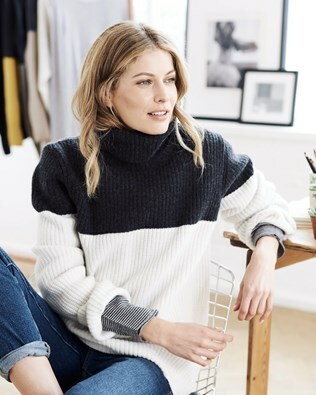 We only use the finest materials to create our stunning knitwear range, offered in an array of styles and colours, suitable for every occasion. Our go-to style this season is the roll neck, a versatile knitwear piece that can be used alone as a statement jumper or under our coats and gilets as layering pieces. Our hero product from the latest collection is the Slouchy Fine Knit Roll Neck. Available in 7 shades, it’s our most versatile knitwear piece. Layer over a long sleeve t-shirt and under a gilet for an effortless nod to seasonal layering. If it’s a statement that you’re looking to make, try the Chunky Fisherman’s Rib Jumper in pink marl, the Ombre Roll Neck Jumper in grey twist or, back in a new colour after last year’s success, the Colourblock Roll Neck in mushroom/grey. With our strong Celtic heritage, we pay homage to our roots with a modern twist on the traditional kilt. Dress it up or down, it’s your choice, with two available colours and lengths to choose from. We’d recommend pairing the Celt Kilts with our Roll Neck Slouch Jumper, the perfect length and weight to complement both styles and colourways. 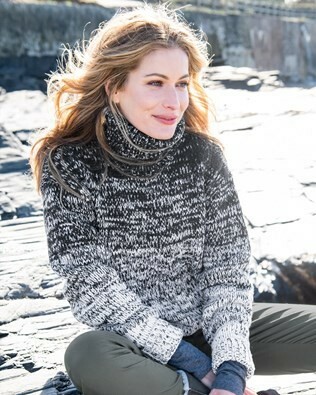 This jumper is available in 4 neutral shades, perfect for picking out the earthy tones in the 'Cairngorm Heath' tartan and highlighting the cooler colours of 'Ocean and Petrel'. Our final style note is dedicated to our timeless, wax cotton collection. Offering a range of designs for all shapes and sizes, choose from the classic and flattering Wax Riding Coat, the stylish Wax Cotton Parka or for a more fashion forward piece, try the Wax Cotton Cape with side splits and a detachable hood. This season we have added to the range with the Wax Rain Jacket and Long Wax Raincoat, a clean and simple cut, available in black. Our entire wax collection is waterproof, ensuring that you stay both warm and dry whilst looking fabulous in the wetter weather this winter. And that concludes our top picks from the new collection, do you have a favourite piece from the new line? Get in touch, we’d love to hear from you….